Okay, so here’s the thing. We US-based Anglophiles can be really terrible when it comes to self-judgment, and the Whovian subset can be even worse. It could be because we’ve been burned before — both by straight-up American remakes and by less-than-ideal co-productions. But we’ve got an inferiority complex about ourselves; as far as we are concerned, we make British things bad. And I can’t argue that point when confronted with a lot of what’s out there, despite occasional evidence to the contrary. We have our own reasons for our knee-jerk reactions to ourselves. Thus when we found out that the definitively English Welsh Torchwood was going international, there was fear. I mean, for God’s sake, it had just managed to get good with “Children of Earth.” Was there a good reason for bringing Americans — let alone a premium American channel like STARZ — into the mix? What was RTD thinking? And how straight-up American would it become in the process? “Miracle Day” is not, however, pure science fiction. There is a great deal of social commentary — occasionally heavy handed but usually justified — as the world attempts to cope with its growing population and public feelings on people who should be dead and what to do about them. In the midst of this, Danes is pushed and pulled by various individuals into being a poster-slash-whipping boy for the event. The series starts eventually to delve into Jack’s own past, which may have something to do with the Miracle. In fact, it probably does. Because, well, at the same time that the rest of the world became immortal, Jack himself became the only man on Earth who can die. The ensemble cast is a bit like an atom, with Barrowman, Myles, Phifer, Havins, and Pullman at its center and scattered semi-major and minor characters carrying on extended sub-stories as they go. “Six Feet Under”‘s Lauren Ambrose appears as PR rep Jilly Kitzinger, who insinuates herself into Danes’s situation (and thus into the intrigue surrounding the Miracle itself). Other important but usually unseen characters duck in and out as the story reaches its big finale, leaving — in a bit of a baffling way — some major characters unnamed or even unknown ’til the very last episode. While “Miracle Day” seems to clue the viewer in enough to character backgrounds so that a new audience can engage, it was helpful to know previous Torchwood … and, more than that, Doctor Who. While RTD has said you will never see the Doctor make an actual appearance in Torchwood, he is referenced more than once: not only via the occasional alien species name-drop or “it’s bigger on the inside” in-joke, but by name, as a person, and with great fondness. The Doctor is an essential element in the series, and all that’s missing is his actual physical presence. I mentioned before that the spread to the US was actually beneficial. And this is for a lot of reasons. Many of the writers brought on board are impressive names in American TV — Doris Egan (“House” and “Smallville” writer/producer), Jane Espenson (“Buffy the Vampire Slayer”), and John Shiban (“The X-Files”), to name a few. And the new American cast members are well chosen. 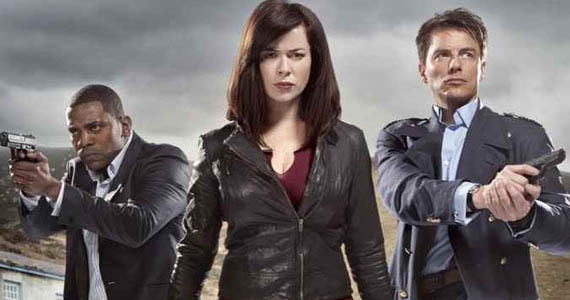 But the best thing we’ve brought to Torchwood? It’s not as though we haven’t known he’s a good actor. Hell, he was one of the things that put people’s minds at ease about the new cast. But this? As Danes he is, quite simply, a monster. He’s a frightening, legitimately horrible, bad person. And his performance steals the show right out from under everyone else — even Barrowman, and he’s still in top form. Right down to his last few lines in the last episode, he’s utterly chilling. “Miracle Day” takes things right up to the last second of the last episode. Literally. Is it a satisfying ending? Well, it’s epic, at the very least. Some analytical minds might want more explanation than we’re given, but we have our answers, if not our nitpicky mechanics. And it looks as though they’re banking on another series. Which I’m fine with. Torchwood took about a dozen huge risks, and while we are not met with perfection, I think we’re certainly met with success. I’ve heard some bad buzz from UK viewers, but I can’t be sure if that’s because of legitimate dislike or because they’ve got an edit different to ours. I can only hope this is a sign of more to come — not just for the series itself, but for well-thought-out trans-Atlantic collaborations. The final episode of “Miracle Day” airs tonight on BBC One. How does it feel getting stuff last, England? Eh? Now you know how we poor bastards feel. You forgot to mention John de Lancie aka Q also guest starred, brilliantly I might add, in a few episodes. He was no insignificant either. The casting on Miracle Day was pretty brilliant I’d say.